Last night I replaced the screen (old one was cracked) with a new one from etech parts. It may just be because it is clean, but it looks a lot clearer and brighter than the old one. Since it is lit with a fluorescent, the new screen likely IS brighter. Unfortunately, the power connector for the backlight is hidden deep within the hinge so I had to remove the whole top cover and then put everything back together again - with no leftover screws. 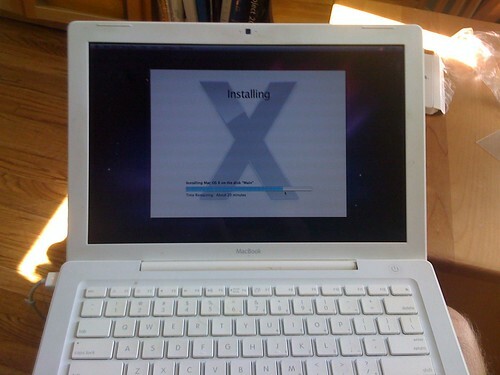 With that done and Apple's new Snow Leopard OS X 10.6 just out, I installed upgraded it too. Went flawlessly, except that I needed to re-enter my wireless network key. I haven't checked all my apps yet, but I did hook up Mail to the corporate Exchange server - just a couple of clicks and it seems to work. Best $29 I ever spent on an OS. The final thing is to get a new battery. It is showing "replace soon" as the status and it runs low very quickly. Still, it has been about three years so I can't complain too much. The previous article is Virtual Machines and Project 2010.